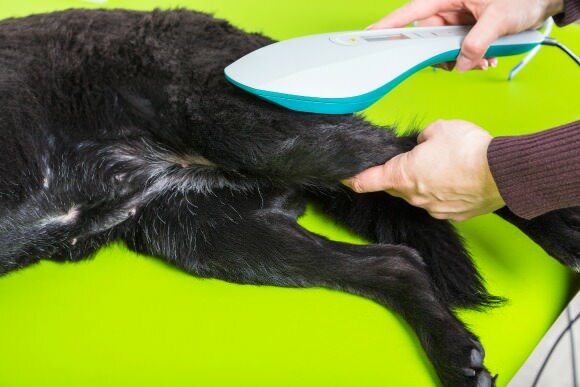 Can Cold Laser Therapy Benefit My Dog? 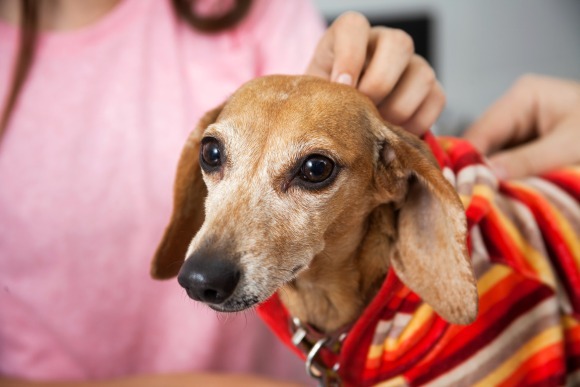 You are here: Home / Dachshund Health / Can Cold Laser Therapy Benefit My Dog? When Gretel injured her back, and was diagnosed with Intervertebral Disk Disease (IVDD), I wanted to get her on the road to healing as fast as I could. After the initial shock, I was like a steam train charging forward. During our first visit with the rehab vet, I explored absolutely every treatment I knew existed. I went armed with a list of about 10 things and made the vet explain every single one to me. One of the items at the top of my list was cold laser. A dog that I walk has back issues. His Mom mentioned that she takes him in for cold laser therapy treatments and it’s really helped. When I mentioned this alternative therapy, Gretel’s rehab veterinarian wholeheartedly endorsed it. We started treatments only a few days after her injury and I’m convinced that it was key in her recovery. In Gretel’s case, her injury was mild (Stage 2 IVDD). She didn’t have as far to recover as dogs who become paralyzed. However, she still had pain, nerve damage, and reduced feeling in her back legs. After a year of rehab therapy, I can happily report that she’s back to her old self – the happy, active hiker she was before the injury. However, because IVDD is a disease, there is a chance that Gretel’s spine will fail again. I don’t think I need to treat her like glass but I do need to watch her for any signs of re-injury and do what I can to prevent or minimize any future episodes. Part of my prevention plan includes core strengthening and balance exercises. My plan also involves keeping any swelling to a minimum. I do this trough a combination of anti-inflammatories (my vet signed off on this) and going to the vet for a laser if there are any signs of trouble. “Laser therapy is an FDA-cleared modality that reduces inflammation and that results in pain reduction. Laser therapy is effective in treating acute pain, chronic conditions, and post-operative pain.” – Carol, Fidose of Reality, from Diary of a Dog Undergoing Laser Treatment. Cold laser, also known as low-level laser therapy (LLLT), is a noninvasive procedure that uses visible and near infrared (NIR) light to stimulate cell regeneration and increase blood circulation. Overall cellular function is increased, allowing for rapid absorption of nutrients, elimination of wastes, growth fof new cells and nerves. Often, when people think of laser, they think of the burning rays like in movies. Or maybe they’ve heard of lasers being used for surgery to cut tissue. These could be called “hot lasers”. However, the wavelength (typically 600-950 nanometers (nm) depending on the condition being treated) and power of cold lasers is such that it doesn’t cause tissue warming. It will not burn your dog’s skin. Can Cold Laser Treatments Benefit My Dog? “Dogs that receive low-level laser treatment after initial surgery [for IVDD] are walking a full week earlier than patients that do not receive the treatment,” said Dr. Tom Schubert, a professor of small animal neurology at UF’s College of Veterinary Medicine (source). Cold laser has only been used in the United States since 2002 but it’s been used widely in Europe and Asia for a long time. There are studies showing the benefits of cold laser for people but there are few studies of it’s use on animals. Of those, some say it is beneficial and others say it doesn’t really do anything. Because of this, it’s still considered “fringe”, or alternative, therapy among many veterinarians. It’s been gaining some mainstream acceptance though as more and more vets are seeing results. Cold laser can be helpful for dogs trying to avoid surgery (using conservative treatment), dogs recovering from surgery, or active dogs that compete in sports. As I said, the potential benefits aren’t universally accepted among veterinarians. Some are just generally skeptical because they think it’s the latest gimmick from the holistic veterinary community. However, Laser therapy has been used human medicine for a long time and produced results. It’s just now being applied to animal cases though so it seems “new”. Almost every pet parent I hear from that has tried cold laser said they thought it made an important difference for their dog. For more check out the 10 common criticisms of cold laser therapy and read the evidence-based responses. Where Can I Get Laser Treatment for my Dog and How Much Will It Cost? There are really only two options of you want to try cold laser therapy for your dog – go to a veterinarian or rent/buy a laser for home use. Most of Gretel’s treatments were performed at her rehab veterinarians’s office. The cold laser at a veterinarian’s office is often higher-powered that what you can purchase for home use. You can also be sure it’s done right because the person administering the treatments has been trained to do so. Because a veterinarian’s laser unit can be expensive ($10,000 or more), and you are paying a veterinarian for their time, treatments are not cheap. Gretel received treatments 2 times per week in the beginning. I was told she needed it at least once a week to be effective. If I could have afforded it, she could have had 3. Treatments at my vet are about $50 each. That meant I paid $100 per week, or $400 a month, for her treatments. If I had just done one a week then it would have been $200 for the month. If I had done all 3, it would have been $600. So, how much does cold laser treatments for your dog cost? Initially, somewhere between $200 – $600 a month. Once a dog is past the initial treatment period – which varies but is typically 1-2 months – and results are achieved, they can go into a maintenance routine. This maintenance routine will be determined by the veterinarian but is usually 1 treatment every 2-4 weeks, or approximately $100-$300 for 3 months. Another option, if you are convinced that the laser will work for your dog, is to rent or purchase a laser for home use. There are definitely some issues with going this route but there is also the potential advantage of lower cost (especially if you also plan to use it on yourself), convenience, and comfort for your pet. Having a laser you can use at home on your dog can save you time driving back and forth to the vet and in the waiting room. Even if your vet is close, it will probably save you 1 hour per treatment. If you travel a lot like us, you may not even have access to a vet that can provide treatments on the road. It’s also more convenient for a pet who tends to get stressed at the vet (or in the car). You can give them treatments in the comfort of your own home is less than 30 minutes (most home treatments take 5-15 minutes). It can also end up being cheaper. I’ve actually looked into purchasing a unit for home use. If I get one I plan to use it on me too. I will likely buy the MyPetLaser or something similar. After tax, this unit would be around $3,000. That sounds super expensive, right? Well, let’s say I want to give Gretel regular maintenance laser treatments year round. If I give them to her every 2 weeks, at $50 each, that’s $1,300 a year. Since her condition is chronic, I will want to do this for the rest of her life. In 2.5 years, the unit will have paid for itself. I plan to use it for Chester too so it will actually pay for itself in half the time. Note: If you want to rent MyPetLaser to try it out, contact Dr. Youkey at Laser-riffic.com. She gave me a discount on laser rental so I could try it and tell you what I thought. Her service, and willingness to answer every little question I had, was top-notch. If you already know you want one, you can use the code LONGBACKS to get $125 off of the retail price of the laser. The primary drawback is that the information out there about cold lasers for home use is confusing. I’ve found a lot of great information online but, although I have a science degree, it’s still hard to wrap my head around. There is a lot to understand. To further complicate matters, there are companies out there who are just trying to make a quick buck off of this trend. Everyone will tell you why their laser is better than the others and it all sounds pretty convincing. If you are going to buy a laser for home use, you will have to do a ton of research and hope you’re getting the right one. The other drawback is that you have to know how to use it effectively. Although you can’t burn your dog with the laser, many come with different settings to treat different ailments. It’s not always easy to understand which setting should be used for which condition. You also need to make sure you are applying it to the specific area that needs treatment. Since many muscle and joint injuries are under the skin, they are not easily seen. You’ll probably have to visit your vet once or twice after purchasing the laser so they can show you how to use it properly. The bottom line is, I think cold laser does have potential to help a dog avoid surgery or heal from surgery or an injury. Some studies have shown it to be effective. Many veterinarians are now convinced that it works and offer the service in their clinic. When I wrote about Gretel’s IVDD diagnosis, a couple of dozen people at least said that they tried laser for their dog and felt that it made a significant difference. It’s not guaranteed to work though. The only real way one would know is to try it and see. Because the treatments are not cheap, and often many are needed to see a difference, deciding to try it or not is a personal judgement call you have to make. Since cold Laser therapy offers a non-intrusive option to acupuncture and surgery, and provides a non-addicting treatment that eliminates the complications of long-term drug treatment programs (side effects), it’s worth taking a chance for some people. 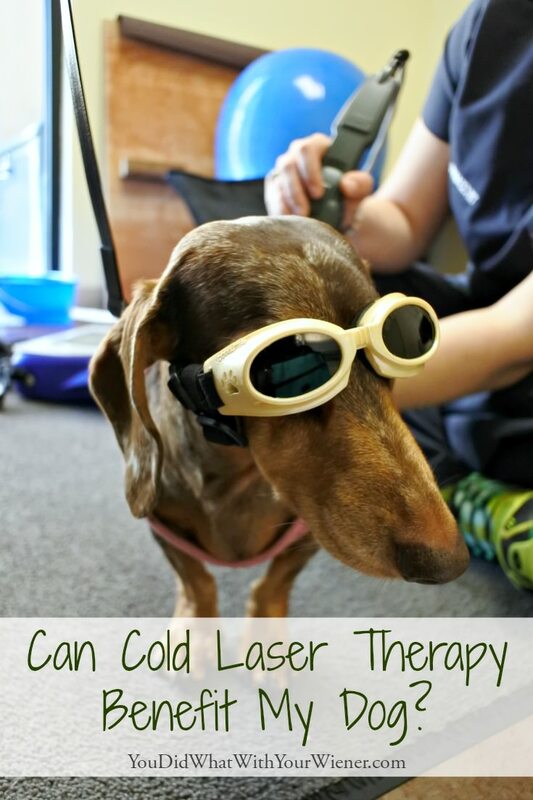 Have you used cold laser therapy for your dog? What did you think? My guy with the chronic iliopsoas injury gets regular laser. I think it helps him, though it’s not dramatic. It may just help me to feel like I’m doing something for him! But I am grateful to have the option. I admit that I wasn’t sure it was helping at first either. She did seem to have a little extra pep in her step after though. When I rented the laser, I also used it on my plantar fasciitis (an off-label use since it’s intended for animals but it’s not unsafe to do so) and my feet actually did start to feel better. That helped confirm that it must be working for her. We have clients that use cold laser and love it. Have you tried sports massage? It will complement the laser therapy and also help prevent muscle imbalance leading and future injury. Not sports massage but I massage and stretch Gretel at home myself. My holistic veterinarian showed me how. I’m glad the cold laser treatments helped Gretel. I had zero idea you could buy one for use at home. Yeah. The problem is that “everyone” will try and sell you one. They’ll all promise results – whether it be for beauty of health purposes – but not all are actually effective. I’ve been doing a ton of research and I am STILL half confused. Ha, ha. been doing this for many yrs on all of my dogs. helps them heal faster. also do acupuncture, and my vet now does adjustments. she is a homeopathic vet. i also have an assisi loop that i use at home. i am trying to get my tens unit to work but it does not stick to their hair very well. Sounds like your pups are very well taken care of 🙂 We also have an Assisi Loop. I like that you thought to treat your dog with cold laser therapy to help with her back pain. I have never thought to do that, but I’ll have to keep that in mind. I have an older dog that suffers from acute arthritis, cold laser therapy might be a good option for us to try with him. Thank you so much for posting this. I never knew there was laser therapy for dogs, this is something I am definitely going to look into for our older girl Hammy! Her arthritis seems to be flaring up more easily lately and I’ve been looking into different options. I’ve never heard of negative affects from cold laser. At worst, people may note that they didn’t notice a difference. If you dog is walking worse then their condition might be worsening. I would definitely consult with your vet. My dog had her first laser treatment yesterday for IVDD. Prior to the treatment she was able to stand and even take a few steps on her own. Immediately after the treatment she couldn’t even stand for me to put her diaper on. It’s been about 36 hours and she hasn’t gained any strength back. We are going back to the vet tomorrow for a recheck and possibly another treatment. I’m really worried about her though because all of the progress she made was wiped away after the laser treatment. Hi Carly. Sorry to hear your pup has a setback. I’m sure that is really frustrating. Hopefully your vet has some answers. I started Gretel on laser treatment about 10 days post injury and there was nothing but improvement from there. I will say though that I have had cold laser myself for several different things and I always feel like the area is a little more irritated after the first or second treatment before it gets better. It does sound very unusual to me that she is still weak 36 hours later though. I’m wondering if the setback was just coincidental and that her condition has worsened. I sure hope not! Keep me posted. Thanks for sharing that info and I’m glad you found treatments that are helping your pup. Stem cell therapy is something I asked our rehab vet about when Gretel hurt her back but I was told her condition was too mild to try that kind of treatment. Carly’s pup is clearly having more trouble than Gretel did though. I second the advice for her to ask her vet about that treatment. I have a Lhasa Apso with joint pain and the cold lasers have helped him a lot. I also haven’t seen any side effects. She just gets around more easily now. 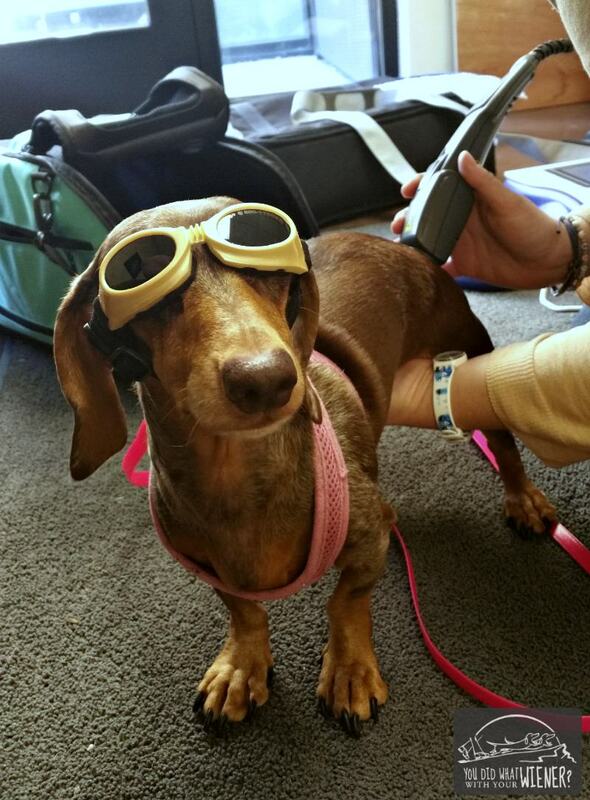 Thanks for pointing out that laser therapy can help to reduce swelling. My beagle was running around playing catch with my children yesterday, and I’ve noticed some swelling on his legs since then. I’ll take my pet to get checked out by a vet to see if laser therapy might be an option. I just bought the My Pet Laser from multi radiance medical. My dog also has IVDD. How often are you using the laser on your dog? Do you only use it during a back flare or do you use is to help prevent flares? Hi Jennifer. I use the laser for my dog during times when she is very physically active and the risk for inflammation and re-injury is high. For us, that is during hiking season. I would also use it if she had an actual back flare-up no matter what time of year but, thankfully, she hasn’t had one yet. As for how often on those days, I was instructed by Dr. Youkey at Laser Riffic (https://www.facebook.com/laser.riffic), who I bought mine from, to use it for 2 full cycles a day – one in the am and one in the pm. I believe the cycles are 5 minutes each. I hope that helps and that you are happy with the laser! We recently had emergency surgery for our Corgi and it was totally unexpected, as the vet explained that we had to have it immediately while she still exhibited deep pain. We proceeded with the surgery and it has been 9 days since and we are following up with administering phy. Therapy as instructed by the vet. She still has no response in her back legs and no control with her bodily functions. The surgery was sooo expensive that we took out a credit care care to pay for it and expended all of our money on harnesses, vet before and after etc. we are at wits end and exploring cold laser treatment, we are unsure if we should proceed or give our girl more time with our current Manuel therapy as we are already experiencing financial hardship. We just hope she can regain her mobility back. Hi Carolyn. I’m sorry you guys are going through this. Do know that 9 days is not very long. It is true that surgery does not resolve 100% of the problem 100% of the time but it is also very possible that your dog just needs more recovery time to make the improvement. I assume since you are doing physical therapy (with a trained veterinarian or under supervision of one I hope) that your vet is aware of your dog’s progress. What did your vet say about cold laser? I’ve had a good experience, and heard from many other dog owners who have also, so I definitely endorse it. I totally understand that cost needs to be considered too though. Perhaps you could try it once or twice and see if you notice any difference?